The longest I've hiked without meeting up with someone not in my party was four days while backpacking in the Rocky Mountains. But, on most day hikes, you will probably encounter other hikers and maybe some bikers or horse riders. Being prepared for these meetings before they happen is a good thing. There's a saying: You'll never win a fight with an automobile. The same general rule applies to any situation in which you find yourself - the bigger object wins. On trails, a hiker is about the smallest, slowest object so it is in your best interest to yield to any other mode of transportation you encounter. A commonly used trail sharing sign is shown here. The concept is that bikers are fast and can stop and go easily so they let everything else have the right of way. Horses are big and unpredictable so they get the right of way. As a slow, unprotected hiker, I'm not about to argue the right of way with a horse or biker or ATV or anything else I might meet. I will always politely yield the trail and use the time to take a deep breath and say 'Howdy'. Stay to the right on wider paths. When overtaking someone, let them know you are approaching and will be passing on their left. You may hear a biker call out, "On your Left!" as he comes up from behind. That means you should stay to your right. Whenever you stop for a view, a rest, or to yield, move off the trail so it is free for others. If you are selecting the spot for a rest, get off on a used area or a durable surface such as a rock, dirt, or snow. Don't just trample off the trail into a nice soft field of grass and flowers. Greet people you meet. This makes sure they know you are there and is polite. A simple "Howdy" or "Nice Day" is fine. When hiking in a group, yield to single or pair hikers. It's harder for a group to get off the trail so often times singles will stop and let you all pass, but its their call. Hike Quietly. Echos are fun, but keep conversations quiet and enjoy the lack of horns, engines, and city noises. There is such a thing as noise pollution. And, in my view, cellphones are the worst form of this pollution. Don't leave any markers when hiking off-trail. Cairns, ducks, or little piles of rocks are not needed. If people are hiking cross-country, their compass and map are all they need. Markers tend to concentrate traffic which creates more unmanaged trail scars. Or, markers pop up all over and serve no navigational purpose. Pack It In - Pack It Out. I am always amazed to find litter. It just does not make sense that someone spending time to get out into nature would purposely destroy it. I just don't get it. Take a Picture. A pretty rock or a bunch of flowers deserve to remain where they are. We have a need for mementos of our adventures, but picture in your mind what the place would look like if the group before you had taken what you are about to put in your pocket. Report vandalism. If there is contact information at the trailhead, tell the managing agency of any destruction or management needs you notice. You will run into some people that feel they have a right to do whatever they want outdoors. You'll see areas where horses were tied to trees, ruining the bark and killing the trees. You'll see wide, braided trails around muddy spots with footprints, hoofprints, and tiretracks all adding to the damage. You'll see washed out gullies created by mountain bikers having fun tearing down the mountain. You'll have a biker fly past you with no warning. These are the people that make an impression. Keep your eyes open for them for your own safety, but also recognize the many others that are courteous and polite. And, make sure people put you into the courteous and polite category after they've met you on the trail. Feb 16, 2012 - Frank Will - a.k.a "Trail Dog"
Thank you for the wonderful trail info. It would also be nice to include the proper use of whistles. Not sure where it ever became etiquette to yield to uphill hikers. Hiking solo today and gasping for breath on the uphill climb, I met six people who wanted to yield the trail. Give me a break. Please! I wanted to stop and catch my breath. I stepped off the trail to catch my breath. I commented to them that I never did understand the logic for the yielding to uphill traffic. Turns out these hikers also agreed that it was a poor rule as they saw me gasping for air. However, it is a good rule for vehicles. Vehicles going uphill should have the right of way on those narrow roads. Stopping, they may never get started again going up hill. Like your caveat noted, it is up to the hikers who decide who will yield. Thanks for the info on horses. As a horse back rider, Im often frustrated with the lack of education about or concern for equestrians. Often we get off the trail anyway because it is not worth my life hoping that the bikers, dirt bikers and hikers are educated about yielding to horses. Most hikers and bikers I come across are very courteous, but it is the ones who aren't that can get me killed. Can I have some suggestions. Cyclist, Please as you approach from behind, give a yell that you are there and coming up behind. Hikers please, when get off the trail don't hide behind bushes. Stay visible and speak up; say "HI". Horses are prey animals and it is the mountain lions who stay silent and hidden. Horses, don't always recognize you and your backpack as a human. Speaking out will tell the horse, you are not a predator and you are not going to eat them. Equusrider - on my AZ Trail hike, I carried a silver sun umbrella many days. The first horse I encountered stopped dead in its tracks about a quarter mile away and I was a bit confused. Aha! I collapsed my umbrella and kept walking and the horse was fine. I guess I looked like a very strange Something out there. After that, I would collapse my umbrella as soon as I saw a horse. I want to thank you so much about the downhill uphill rule. Because I love to hike uphill and take a no prisoners style of hiking approach. On the way down I enjoy the scenery and sometime jog but feel no pressure and enjoy being sociable. Also I sometime hike with groups and didn't know that singles and couples had the right of way thanks for the great info. I always yield to horses, but it seems to me that horse people approaching hikers should communicate and take responsibility for not running people over, just as cars are not allowed to run people over in the street. I can't possibly hurt a horse if I run into it, but the horse can hurt or kill me. And horse can move infinitely faster than I can, especially if I have an overnight pack on. Again, I personally always yield thoughtfully and politely, but it seems as though theoretically the horseback rider should take responsibility for not hurting hikers first. Then, if the hiker is nice, s/he can choose to yield to the horse since it's easier as a person to get off the trail than it is for a horse. But if for some reason the hiker doesn't choose to yield, the horseback rider should at least hold the horse still until the hiker can get by. Does this logic seem reasonable to anyone else? Another trail etiquette rule not mentioned: stay in communication with your own hiking party. If you and your buddies stop for a quick rest at a beautiful view or shady creek, make sure your group knows if you're hiking on before they're ready to go. Likewise, know where partner(s) are before you hike on. I was one of a group of three that stopped at a creek last weekend -- on a quiet, unpopulated trail --and the other two left the creekside while I was digging in my pack for my camera. I didn't hear them go and was lucky to spot them way up the trail when I noticed they were gone. Either they didn't care or didn't notice...either way, it is bad form and potentially very dangerous. Neet - sure, it makes sense. But, a 150pound person can't force a 1,200pound horse to stay still or not be frightened. And a frightened animal can't be controlled. The point you made is a key reason for humans to give way to horses - we make much less impact. 200pounds distributed on 2 footprints is a lot less disruptive than 1500pounds on 4 hooves that are stomping around instead of standing quietly. Using your analogy, a hiker that refuses to give way to a horse is about as bright as a pedestrian that refuses to give way to a car. ----------------- katrina - keeping a group together is more of a safety note than etiquette, but it is important. Communicating in your group and watching out for each other should be a set expectation before you ever set foot on the trail. I'll add a few observations. Re horses: they often come in groups, and seem to include very inexperienced riders. Applying the rules of the road seem unwise. After all, vehicles presumably all stop or slow as expected when brakes applied. Why assume so with a large, burdened animal. Out of their way and not spooking them in any way is very sound. Re bikes: I have rarely encountered a bike that yielded or slowed at all around hikers. They also often approach from behind with little warning and can startle. Those simple thumb bells we had on our bikes when we were 10 would help, but they are so "unhip". I have little suggestion for the hikers though. Being a horse rider I can only say that horses are "unpredictable". The yielding to horses rule really is for the safety of the hiker... Even a very experienced rider on a very good trail horse will run into hairy situations. If there is a poor person on the way it cannot end well. I've been stepped on more than once by great horses that got spooked by the most banal such as a strange looking log (really!) - It could break your foot or a toe very easily. frustrated - Too weird. Doesn't make sense to me to leave my warm house and walk to a neighbor's property to use it as a bathroom in the cold morning. If you know who it is, and it is your property, can't you just tell them they are not welcome on your property? If you have video of them leaving the trail and going into the bush, tell them that and then provide it to the police if you need their assistance. What is the accepted method concerning walking trails with dogs on a leash. Certainly, the leash should be as short as possible and trained dogs walk on the left of the human. That places the dog close to passing traffic (other walkers, bikes, etc). I ask because even dogs who behavior well may cause concern to passing traffic (or meeting traffic) as some may not see the dog until passing. John - On a shared use trail, everyone is responsible to be in control of themselves and their pets. That means having a short leash (not a 6 or 8 foot leash) so your dog can not attack another pet or trail user. If your dog tends to be aggressive, a dog muzzle would be good, or walking it where there are no other people around. If that's not the case, then it's just a matter of preventing collisions. The other trail users have the responsibility to be in control of their bicycle or their feet. They should be able to stop quickly when passing you since your dog may take a step into their path. As you probably have experienced, this often is not the case but it is the goal. So, dog on short leash on your left is just fine. If you see someone coming towards you, you can certainly guide your dog to your right side of the trail until the person is passed. I expect he'll enjoy exploring whatever he finds off the trail, too. Thank you for these great tips on trail etiquette. I have shared with my walking/hiking group in the Bay Area, pointing them to this web site as well. Good info on trail etiquette. My concern is the amount of dogs off lead. I like dogs, but I don't enjoy a dog running full speed up to me and the whole "it's ok, he's friendly", mentality. This is some good info to share. From a deaf hiker. Please bikers if you call out "on your left" and the hiker do not move, do not carry on at full speed, give the hiker space. I have been hit by a bicycle more than once. I always hike with hearing people but they not always have time to let me know. People usually give space to special need hikers, but hearing impaired hikers are not that easy to spot by eye. Great info! I recently hiked in Grand Canyon and wanted to get my body warmed up during the start of the hike downhill as it was a cold morning, too. There were a LOT of people going downhill and in my excitement to jog, I put on my earphones and started to sprint heartily downhill. Almost everybody I passed were courteous and even exchanged a smile, but, I believe a few weren't too happy about me passing like that. Would you say I was being rude to my fellow hikers? By the way, just like me, few more people were jogging/sprinting/running along as well. Also, I'd like to know your comments on listening to music during hikes. Listening to headphones to me is like going to a free concert, and then putting on headphones and listening to different music than what is playing at the concert. Running on trails that are used by walkers and long distance hikers is also like bringing your city apartment sidewalk out to the wilderness. Most people do tolerate trail runners. Trail runners are also very unaware audibly or visually of anything going on around them, other than the 2 metres in front of them. They are the ones that aren't prepared (with any gear) for anything when something bad happens. Trail runners also tend to be a distraction on the trail from the wilderness around. So yes, wearing headphones, listening to music and trail running... why not just stay at home and run on a treadmill and look at a 3d bluray of the Canyon? Most hikers do go into the wilderness to experience it at a slow walking speed and to have all their senses stimulated by the nature around them, including the natural sounds. Karthik - I like cobalt's analogy, but don't feel so strongly his generalization of trail runners. Wilderness races are popular and I have no problem with people running on trails. But, they have a responsibility to stay in control, be safe, and not impact other users. It would make sense to slow down and announce your presence when overtaking someone - something like "passing on your left, please". As far as listening to music - I think it's unsafe, distracting, and silly. It tunes out the world around you and you may not hear important sounds, such as snakes, animals in the brush, yells for help, or runners overtaking you saying "on your left". I disagree with your rule concerning uphill/downhill right of way. I don't know where that rule came from, but it creates danger for the person going downhill in exchange for convenience of the person going uphill.True that hikers going uphill are working hard, however it is very easy for them to stop and actually when the incline is very steep they are stopping with every step anyway. Going downhill, gravity is pulling us and makes stopping more difficult. Downhill stopping often can be dangerous especially when the trail is sand, gravel, loose dirt, etc. when putting on the brakes can cause our feet to go out from under us. Often the situation calls for running down a short ways. Also, I would like to argue that going downhill a hiker does NOT have a much farther view ahead than someone going up. I look at every step I put my foot down. The hiker that looks around not paying attention to every single step will eventually hurt themselves, especially going downhill at a faster pace. @larry - The general guideline is to be in control and be courteous. If it would be dangerous for a hiker to stop his steps, then that hiker is not in control and needs to slow down more. Stopping should never be a difficult thing - if it is, then the hiker is not in control. Your point of view that a hiker going downhill does not have a farther view is incorrect. It has nothing to do with 'looking around and not paying attention'. It has to do with the ground angle ahead of you and your eyes tending to watch the trail before you. Hiking Dude and Neet - I grew up on a horse farm and trail riding was a way of life. 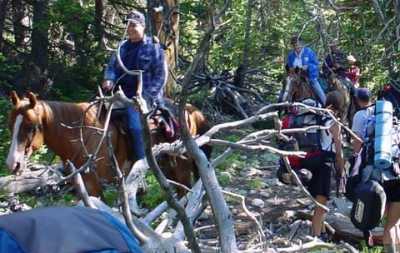 Hikers forget how the gentlest of horses can be spooked. They are all instinct and no brains. A glint in the stream caused a horse to rear up, slip, and pin the rider. A pop of a soda can made a mount buck the rider into a power pole, breaking his neck. The pain of a horse-fly bite made a horse "cow kick" breaking a leg. My point is you just never know. Be aware of their blind spots, be aware of your own actions, don't separate a horse from the its herd, ask to approach, introduce yourself to a horse the way you might greet a strange dog, never approach from behind, and if you must walk around a horse, keep a hand in contact as if you were grooming the horse. As for right of way, even in situations where you think you are in the right, don't push your luck. Pedistrians are in their right to cross a road with a white walk sign, but you still look for cars that don't stop. My two cents on right of way: Resource impacts should be considered. A group of 2 should stepping off the trail impacts the trail edge twice as much as a single hiker. The impact scales up nicely with larger and larger groups. Also, this fits nicely with horses, since sending a horse off trail would be a huge impact. Also, coordinating a smaller group or individual's off trail maneuver is also easier and quicker than coordinating a larger group. Finally, I just don't feel that momentum for the uphill hiker is that strong of an argument and it is difficult to predict what the person traveling in the opposite direction will want to do. I feel like the rules for hiking were transferred from wheeled activities and hooved transportation for nothing more than the convenience of not having another set of rules and don't really take into account new concerns like "Leave No Trace" etiquette. Both AmericanHiking.org and BackPacker.com (as well as many other hiking organizations) agree with the uphill vs. downhill hikers as described on this page - downhill yields to uphill. Nice website. I have to agree with the established cardinal rule; downhill yield to uphill. Have been hiking many mountains and trails for over 50 years. Downhill hikers have an advantage. So please, respect the direction and strength of the uphill hiker. Handy tips! Although make sure you swap left and right when you're in Australia, NZ, etc. (where the foot traffic tends to follow that of cars; keep left and pass on the right). It can be frustrating to be hiking only to have well-meaning people on holiday move to block the way. I have to go with the dissenters and say that uphill should yield to downhill. Downhill has the momentum. Uphill can stop anytime. Unless you're on wheels, the idea that you have uphill momentum is silly. You have to push up at every step. If you stop pushing, you stop. It's really that easy. As others have said, if we were talking about cars that would be another story. I've never been in a situation where I was unable to continue going uphill because I let a downhill hiker pass by. The view argument is also silly for reasons already pointed out. You better watch every step, either up or down. The 'false summit' illusion applies to uphill as well as downhill. Neither one has better visibility, unless you mean visibility of the trail in the far distance which doesn't apply here. I greatly appreciate your inclusion of trail etiquette. Also, the comments on impact. It takes less energy and creates less impact for a smaller group to yield than a larger. I hike with llamas, usually multiple animals (who, as a bit of trivia have less trail impact that a white tail deer. Cool huh? )I ALWAYS yield to horses, allowing as wide of berth as I can and calmly speak to the riders with the animals behind me - this seems to work best. Llamas spook as well. It is an act of congress to move a large group of animals to the side of the trail simply because a hiker or biker refuses to yield. I understand that it can kill the momentum of the biker to have yield consideration, but there is a certain amount of personal responsibility sharing a pubic trail for the sake of safety issues and FUN. Frustratingly enough, many times I am forced to yield and will continue to do so for the safety of my animals from well meaning folks that never considered space to be an issue. I've recently started hiking and now I think I know what letf means! But while hiking I hear a lot of bikers yell "walker!" What does that mean and when there are bikers behind you what are thw things you should do. I'd like a little more info on biker and hikers please. I want to be curteous and share the beauty respectfully with everyone else as well. @Melissa - On a wide trail, with room to pass, a biker yelling "On your left!" means the hiker should move as far to their right side as possible because the bike wants to pass on the left. A biker just yelling "Walker!" lets you know they are overtaking you. I've not experienced this, but would guess it is on a narrow path and they are hoping you might step off the trail to let them pass. However the encounter occurs, it is the biker's responsibility to keep his bike in control and give way to hikers. If I heard someone yell at me from behind on a narrow trail, I would stop and turn around to see what was coming. Then, I'd make a decision about what to do next, which might be a hasty step off the trail if the biker was not maintaining control. @Melissa, were the bikers that yell 'Walker!' part of a group? If so it is the first biker yelling back to the following bikers letting them know that there is a walker ahead and that they should slow down and proceed with caution. I hike the Gateway Trail in the McDowell Preserve and run into rude hikers on a regular basis: loud talkers, people hiking with radios (not the quiet headphone variety) getting body-checked by oncoming pairs and groups of hikers. Today was the worst incident where an oncoming pair of women took up the whole width of the trail. I had no where to go aside from being aggressively pushed off the trail into a cholla cactus when one of the woman body-checked me hard vs falling back to single file as a reasonable person normally would. She kept on hiking and didn't even stop to see if I was okay or apologize - crazy. Downhill yields to uphill. Momentum has very little or nothing to do with it. Time to slow down for downhill hikers is silly, because, if they need special consideration, they are out of control. Field of vision is the reason as mentioned. No matter where you are focusing, when downhill, your peripheral will pick up a hiker below you way before the uphill hiker will notice you with their peripheral...every time. On your next hike, test this and you will agree with the established rule of downhill hikers yield to uphill. Of course, many trail parts are level grade or not steep, so this really applies to trails with a moderate to steep grade. In the end, the most courteous (and the most tired) hikers will yield to others in all of the gray areas. Also, staying together is a matter of courtesy, not just safety. No one likes to be left behind. Stay together and communicate. Isn't that why you are on the trail together in the 1st place, to hike together? "Stay together and communicate. Isn't that why you are on the trail together in the 1st place, to hike together?" Nope...I hike on-trail alone to be closer to my Sierra, not to converse with anybody...plenty of time to "chat" in camp. When on-trail, ok/ preferred actually to hike in quiet solitude but... nobody passes the next junction/trail Y without all checking in before departing. Uphill (progress) before downhill coasting...easier to start up again when going downhill. As a trail runner, hiker and mountain biker, I find myself on the trails in a very big state park local to me. I've always been courteous of other park users, but today, a horse rider motioned for me to stop since I was wearing earbuds because I like to listen to music while I run, and she told me not to ever run past a horse. I wasn't told why. I thought about this for the remainder of my run. I always continue to run but I run off the trail for horses, and off to one side for hikers, runners and cyclists, giving everyone more than enough room to safely continue on their way. I have encountered over 50 horse riders during my runs and never has anyone said anything, or even motioned, and no horses have appeared frightened. I like animals but admittedly know nothing about horses. So do runners spook them or is this a Right of Way issue? @Jeff - Horses have personalities and some are more easily spooked than others. I always stop off the trail for horses when hiking. I would imagine a horse could get concerned if any animal, human or other, came at it quickly. I wouldn't take that chance. Hiking short trail in yellowstone. Argument about which direction to go. One group wanted to start at designated trailhead the other wanted to start at end and then hike back to trailhead. Etiquette aside, do designers take into account which direction to take. What do they consider? Arguments for each case? @Leo - A trail has two ends, or is a loop, or is an out-and-back. An out-and-back has one trailhead and there's only one way to hike it. A loop has one trailhead and you can hike it clockwise, or counter-clockwise. Interpretive loop trails with signage and/or numbered posts are designed to be walked a certain direction. Both ends of a non-loop trail are trailheads and you need to arrange travel to each end in order to hike it. There are many reasons to hike one direction over the other. Here's a few to consider ... Is there a large elevation change? hiking generally downhill will be easier. Is there a great vista part way through? hike so you reach that spot for lunch or a long break. Is part of the trail more rugged? doing that early would be safer. Is part shaded and part open? use the natural cover for cooler hiking. More than once,we met discouraging comments from guys descending while we were going uphill,mt.longonot.We kept on in a single file.Thanks for the downhill rule. I hike the La Luz almost weekly and have not had a single incident with anyone trying to push me over for not yeilding or vice versa. I have asked about 15-20 random groups what they think is the up/down yeild rule. Not one knew, even the Forest Ranger. I would say rules are nice to know but proceed with the expectation that you are the only one aware of the rule. BTW I agree with most of the contrary arguments, but politeness seems to win almost always. I agree with the "Pack it in pack it out" rule. I've been taking a larger than normal backpack when hiking to help clean up the mess that others leave behind. The other thing that I'd say that goes along with the noise pollution would be blaring music. I'm always surprised that somebody wants to go out and take a speaker out to blast whatever music it is that they like while hiking. If you like music on your hike, great! Buy some headphones as the rest of us may not want to hear whatever it is that you thought was nature worthy. So bikes yield to everyone else despite being the fastest moving vehicle on a trail, making the most noise - often alerting others of their presence? The logic you are pushing is VERY dangerous advice. Obviously the individual with the best capacity to move out of harms way would be responsible to yield to oncoming traffic. Your logic is flawed and extremely dangerous to practice. I often see walkers/hikers who make almost no effort to get out of the way as I barrel down the trail with almost no indication of their presence....at least you can hear a bike coming so you are aware there is a danger coming your way. @BigBigL - I expect you may just be trolling since you used the term "barrel down the trail", but I'll reply anyway. Yes, bikes should yield to foot traffic, both human and animal. Unfortunately, there are some bikers, such as yourself, that are misinformed, improperly trained, and self-centered. A biker has mechanical advantage so it is easier for him to start and stop. A biker should always be in control and able to stop. Bikes do not make appreciable noise - they are fast and quiet. That is why a conscientious biker will slow down and announce their presence when approaching others, either from front or behind. Nowadays, the rule is that people going downhill yield to those going uphill. But, 25 years ago, the rule I was taught by AMGA guides was that people going downhill should have priority. Their reasoning was sound: up high is hostile; lower down is safety. So, getting off a mountain should take precedence over people trying to get on the mountain. Things have changed. Nowadays, the priority is to cram as many people onto a mountain, to get to the summit, regardless of conditions and skills. The harsher, the faster, the better. In searching for the reasoning behind the current rule, the argument seems to be that people going up hill are expending more energy. So, we shouldn't interrupt their momentum going uphill, that we need to respect their "strength" and their need for a workout. Yes, "real" hikers and climbers know the de facto rules, but that doesn't mean all these rules are good. As I was hiking down into the grand canyon, I used an umbrella. Really helped with the heat. When I encountered a horse leading a group of riders, I closed my umbrella. I did it too fast and it spoijed the horse which began backing up dangerously close to the edge of a drop off! So, close your umbrellas very slowly aroynd horses. Hiking uphill/downhill: Rules are needed so that in the event of ambiguity the rule prevails. In reality it really boils down to courtesy and etiquette. I always assess those I encounter: first do they see me, how fast are they moving, are their children in tow, steepness of the trail, trail conditions etc., I use that and a big smile as my guide and it works every time. I saw this Cleveland hiking club taking up the entire width of the trail. They were a huge group, so this was really annoying. From what I heard, they've been problematic that way before. You'd think that in a large group, there'd be at least a few people who'd say "Hey, we need to make room for other hikers and runners." Apparently not, though. Not even the leaders.